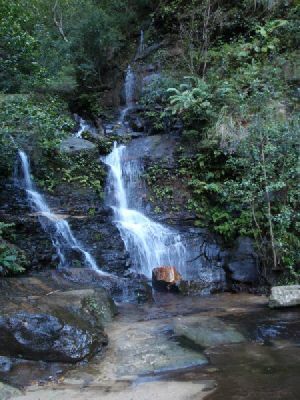 Vera Falls track takes experienced walkers to the end of the Valley of the Waters. 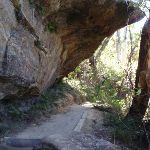 The last half of this track is indistinct and rough in places, following a historic route. 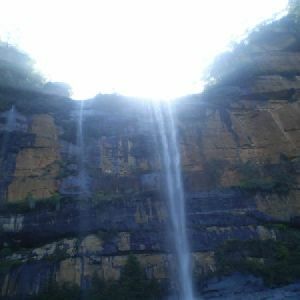 Vera Falls is a spectacular waterfall that can be viewed from the top or bottom. 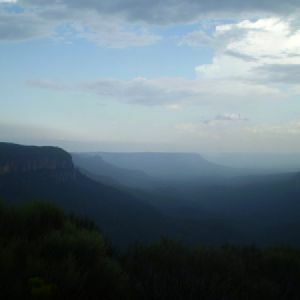 This track may become impassable after rain. 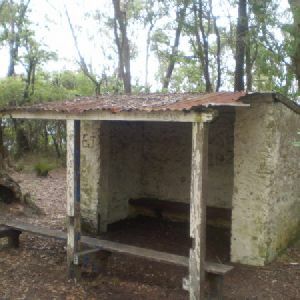 A hot chocolate at Conservation Hut can be a nice way to finish off this walk. 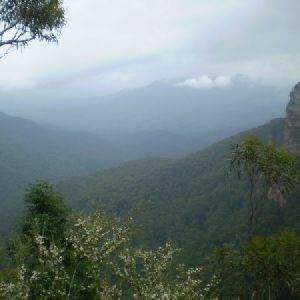 * This walk passes through very remote areas and sections have no visible track. 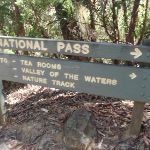 At least one person in your group should have training and experience in off track walking and navigation. 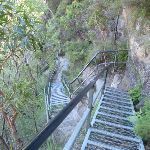 Even with these notes and a GPS these extra skills and equipment are required. 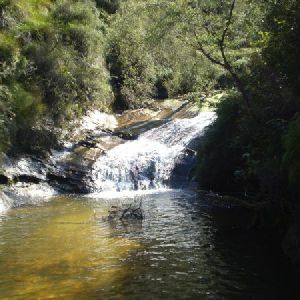 Continue straight: From the intersection, this walk follows the ‘Vera Falls’ sign along the bush track, winding around the side of the hill. 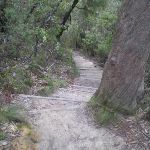 After a short distance, the track turns left, down the hill, along an indistinct track (the wrong way is marked with a dead-end track signpost). 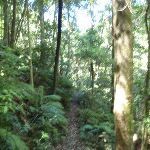 Continuing steeply down the hill, the walk follows the bright ribbons tied to trees along the bush track down the hill until crossing a small stream. 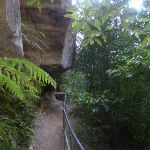 On the other side of this, the walk heads up along the bush track, winding through the forest for a short distance until coming to a signposted intersection of the Roberts Pass track. 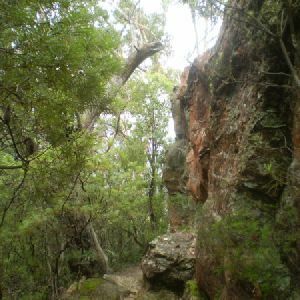 Continue straight: From the intersection, this walk follows the track heading down the hill, winding down past a large square boulder in the middle of the track. 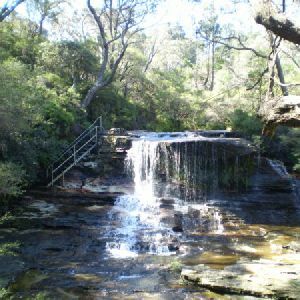 The walk continues down, crossing Valley of the Waters Creek to the eastern bank along the way. 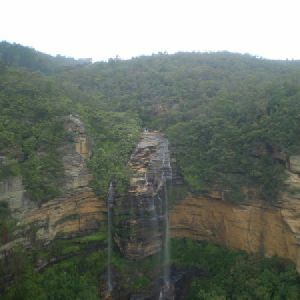 The track bends around to the left as the gully opens out and comes down to an intersection of the top of the falls track. 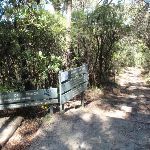 Veer right: From the intersection, the walk follows the bush track heading west, up along the side of the hill, keeping the valley down to the left. 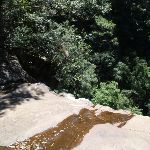 The track drops steeply down the hill to the rock platform at the top of the waterfall. 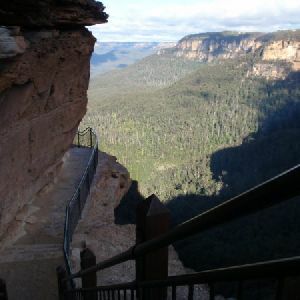 At the end of this side trip, retrace your steps back to the main walk then Veer right. 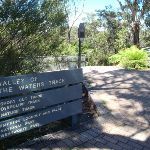 Turn left: From the intersection, this walk follows the track, with the valley down to the right. 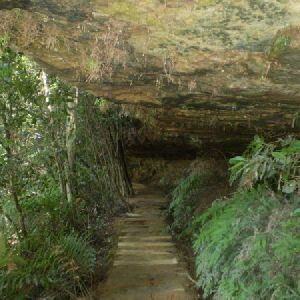 The walk heads around the side of the hill for a short while before turning downhill and winding through the thick forest. 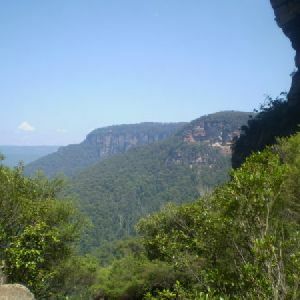 At the bottom of the valley, the track comes to the intersection with the bottom falls track. 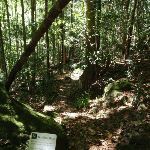 Continue straight: From the intersection, the walk follows the track heading south-east through the dense forest, following the frequently placed ribbon markers. 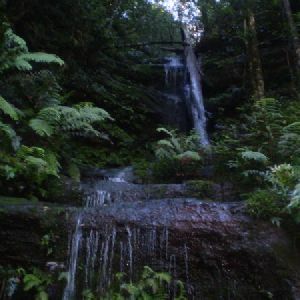 The walk crosses a small creek and continues up through the bush, winding up the long, gentle hill until coming to an intersection with the Hippocrene Falls track. 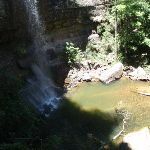 Veer right: From the intersection, the walk heads down the hill towards the visible falls, soon coming to the pool at the base of the Hippocrene Falls. 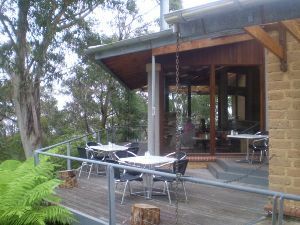 At the end of this side trip, retrace your steps back to the main walk then Turn left. 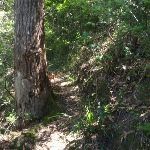 Turn right: From the intersection, the walk heads west through the dense forest, following the sometimes indistinct track and the brightly coloured ribbon markers. 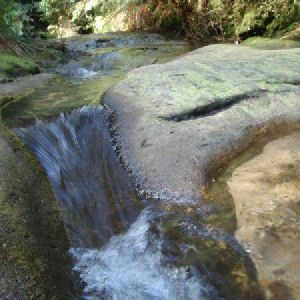 The walk soon comes to the Valley of the Waters Creek, which it follows upstream along the large boulders on the edge of the creek bed, to the bottom of the falls. 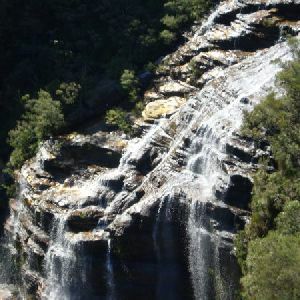 This spectacular waterfall is in the Valley Of The Waters, near Wentworth Falls. 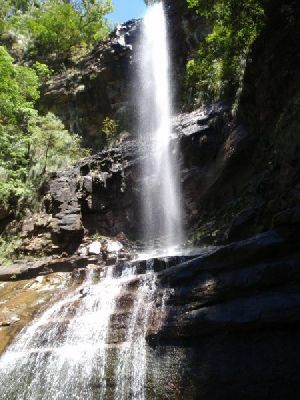 The water falls from a rock platform above (there is a track accessing the top of the falls) onto a rock bulb at the base, where the water cascades into the rock-filled pool at the bottom. 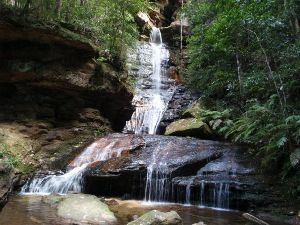 The waterfall is on the Valley Of The Waters Creek, about 150m north of the junction with Jamison Creek. 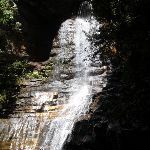 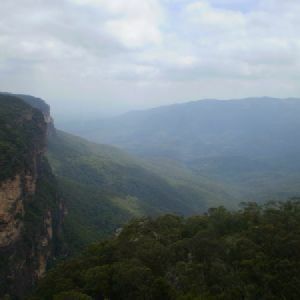 The falls are named after the 9 year old daughter of Frederick Moore, a member of the Wentworth Falls Trustees and a Fellow of the Royal Geographical Society in 1898. 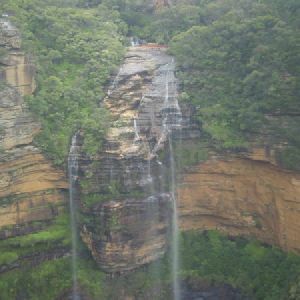 The Wentworth Falls Trustees were tasked with naming all the falls in the area at the time. 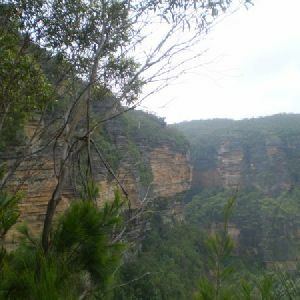 1km of this walk has short steep hills and another 750m is very steep. 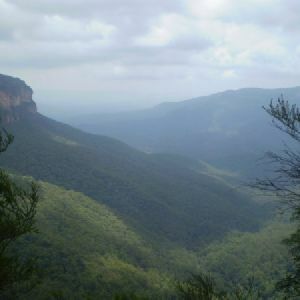 The remaining (140m) has gentle hills with occasional steps. 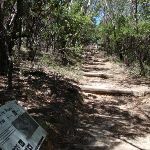 1.1km of this walk follows a clear and well formed track or trail and another 590m follows a rough track, where fallen trees and other obstacles are likely. 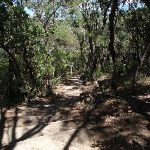 Whilst another 190m follows a formed track, with some branches and other obstacles and the remaining 55m follows a smooth and hardened path. 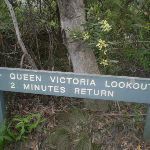 680m of this walk is clearly signposted and another 620m has directional signs at most intersection. 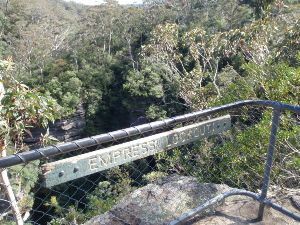 The remaining (590m) Has no directional signs. 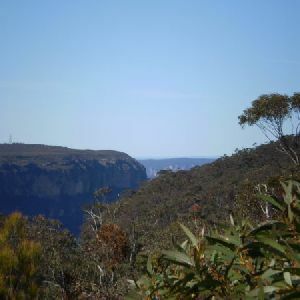 920m of this walk requires some bushwalking experience and another 590m requires a leader a with moderate level of bushwalking experience. 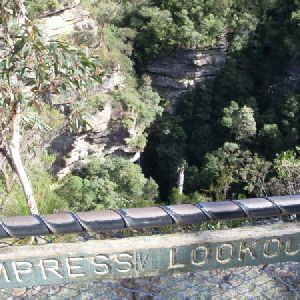 The remaining (380m) requires no previous bushwalking experience. 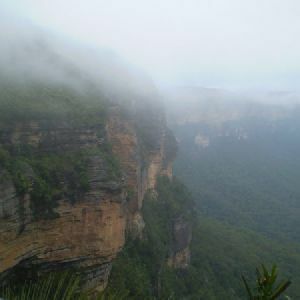 Around 1km of this walk is not usually affected by severe weather events (that would unexpectedly impact safety and navigation), whilst the remaining 870m is affected by storms that may impact your navigation and safety. 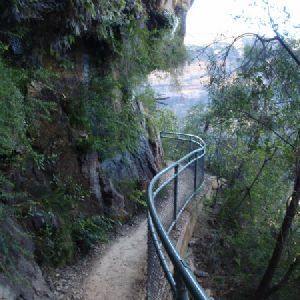 920m of this walk has limited facilities (such as not all cliffs fenced) and another 590m has no facilities provided. 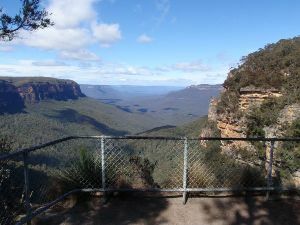 The remaining (390m) is close to useful facilities (such as fenced cliffs and seats). 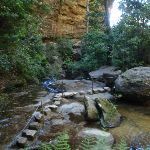 A list of walks that share part of the track with the Vera Falls Track walk. 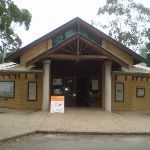 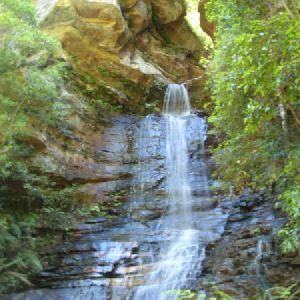 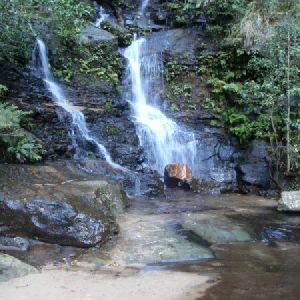 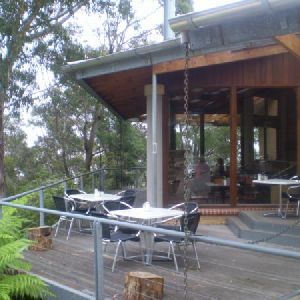 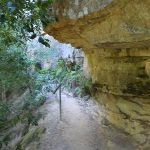 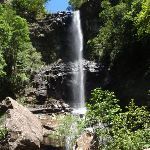 A list of walks that start near the Vera Falls Track walk. 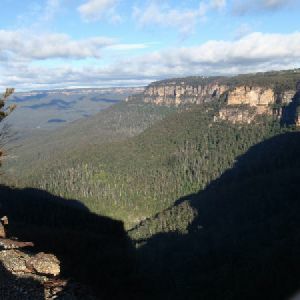 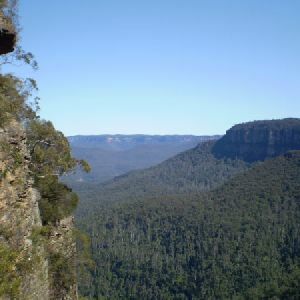 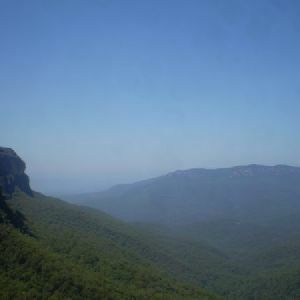 http://new.wildwalks.com/wildwalks_custom/includes/walk_fire_danger.php?walkid=nsw-bmnp-vft Each park may have its own fire ban, this rating is only valid for today and is based on information from the RFS Please check the RFS Website for more information.